Buying a house is a dream for millions of people in India. The government has provided various tax benefits to individuals to encourage them to buy a house propertyunder the ‘housing for all’ initiative. One of the important things to note is that if the property is held jointly, individuals can receive additional tax benefits for the same cost. Highlighted below are the possible tax benefits if the house property is held jointly. A house can be held jointly with anyone not necessarily a spouse or parent, but it can also be with a relative, friend or even a business associate. As per provisions of the Income Tax Act, 1961 (Act), it is possible to claim a deduction for the interest paid on the housing loan under the head “Income from house property”. In case the house property is self-occupied, an individual can claim a deduction of interest paid on housing loan, up to Rs 2 lakh per financial year (FY). However, in case the house property is jointly held, then both the house property owners will be able to claim a deduction for interest up to Rs 2 lakh each per FY. For example, let us consider that the total home loan interest paid in a financial year by an individual who is the sole owner of the house property, is Rs 5 lakh per FY. The total deduction for interest that can be claimed by him will be capped at Rs 2 lakh per FY. However, if the property is jointly held and if the co-owners are paying their respective shares of the home loan along with interest, then all co-owners would be entitled to claim a deduction of up to Rs 2 lakh each per FY for the interest paid on the home loan. In the initial years, when the interest amount is substantially high, a large amount of interest can go un-utilised on account of the cap on deduction of up to Rs 2 lakh. In such cases, under joint ownership, each co-owner will be able to avail the benefit of Rs 2 lakh per FY and the higher payments of interest can be utilised. Similar to the above, holding property in joint names will provide a tax benefit to individuals who receive rental income as well. Firstly, the rental income will be divided between the owners. In case one of the co-owners falls in the lower tax slab rate, they can avail the benefit of a lower tax rate on a part of the rental income received. Secondly, the loss from house property for each individual is capped at Rs 2 lakh per FY for set-off against other heads of income of the same FY. Any loss in excess of Rs 2 lakh will be carried forward to future years Accordingly, all the owners will be able to set off a loss of Rs 2 lakh individually against other heads of incomes. For example, if the interest on housing loan exceeds the rental income and there is a loss of Rs 4 lakh per FY, then in case of a solely-owned property, the owner will be able to adjust the loss only up to Rs 2 lakh against the other income earned by him. The remaining loss of Rs 2 lakh will have to be carried forward for 8 subsequent FYs to adjust against rental income in subsequent FYs. However, if there are two co-owners, then Rs 2 lakh can be set-off by each co-owner per FY against the other income and accordingly, the entire loss of Rs 4 lakh will be set-off in the same FY. Capital gains derived from the sale of house property are taxable. As per section 54 of the Act, if an individual purchase another residential house property within stipulated timelines, the amount invested in the new house can be reduced from the taxable capital gains. Section 54 explicitly states that the amount invested in one residential house property (two properties in certain cases as introduced by Budget 2019). Read the full story here. can be reduced from the capital gains. In case the house property is jointly held, then the capital gains will be calculated for each owner separately and each co-owner can gain the benefit of this provision and restrict the taxable capital gain. Each co-owner can use some/all of his portion of the first house sale proceeds to buy another house (within stipulated time) and thereby reduce his/her taxable capital gain. Consequently, the total taxable capital gain would reduce. As per section 54EC of the Income Tax Act, if individuals invest in specified bonds, they can claim a deduction up to Rs 50 lakh on the capital gains derived from the sale of house property. Considering the real estate prices in India, especially in metro cities, deduction of Rs 50 lakh may not be sufficient to cover the capital gains and individuals will have to pay the tax on capital gains earned in excess of Rs 50 lakh. However, if the property is jointly held, each co-owner can invest separately in specified bonds and separately get a deduction of Rs 50 lakh each on the investment so made. The popular section 54EC bonds are offered by National Highways Authority of India (NHAI) and Rural Electrification Corporation (REC). To sum up, owning a house property in joint names has various tax benefits. However, it is important to note that the house property should also be funded by each co-owner. Also, the shares of the co-owners should be definite and ascertainable. 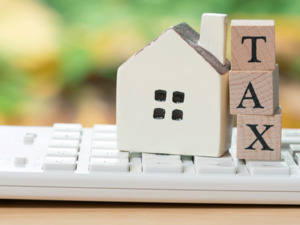 Income-tax authorities are increasingly scrutinising the funding and allocation of shares of the house properties where the same is held in joint names and tax benefits are being claimed by more than one individual, especially when one of the individuals is in a lower tax bracket.